When it comes to carbs, not all carbs are created equally. What does this mean? It means that some carbohydrates that you eat will be absorbed and processed by your body like a normal carb, whereas other carbohydrates will pass through your body without negative dietary effects. The carbs that cannot be processed, and instead pass through your system, are called indigestible carbohydrates. Indigestible carbs are fiber. How do you know which carbs will perform in which manner? There are the normal carbs (like the ones found in fruits, vegetables and starches, and yes, the processed and junk foods too). Then there are carbs which are not digested by your body, but instead, pass through without being absorbed or utilized. A regular carbohydrate will be broken down into glucose, which is the way your body processes the foods you eat in order to turn them into fuel in your blood stream. Carbohydrates are the first choice for energy in the body, which is why, in a ketogenic diet, you limit carbs, and force your body to switch over to burning fats/ketones for fuel instead. When there are no carbs present, your body fat is then broken down and used for energy (ketosis). When you consume indigestible carbs, the body can’t use them and still has to rely on body fat for fuel. Net carbs are the carbs that your body actually processes; the carbs that count. Fiber can be your best friend while on a ketogenic diet. Fiber helps you reduce the number of net carbs in your daily food intake. So, it makes sense that adding a good deal of fiber to your diet would also be helpful in terms of burning off fat. Needless to say, there won’t be a lot of bananas in a ketogenic diet! But, as you can see, the banana has a total of 27 grams of carbohydrates per serving with 3 grams of fiber. All you need to do is subtract the 3 fiber grams from the total grams of carbohydrates (27) and you’re left with the 24 grams of net carbs. You would do this same small calculation with virtually each food you eat. Naturally, meats and most protein sources won’t have any carbs, and no fiber, so you don’t usually need to worry about net carbs with primarily protein foods, unless, of course, you’re getting your protein from other sources than meat, like dairy, cheeses, nuts and nut butters. 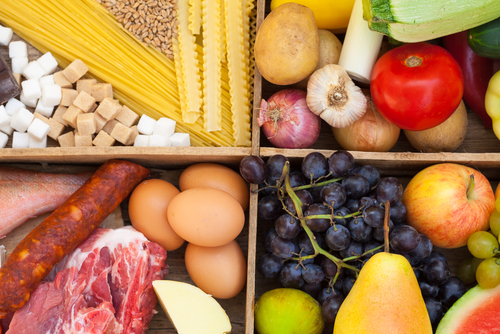 The takeaway point here is that the bodily effect of many carbs will be negated by the fiber you eat, so once again, load up on the fibrous veggies and other low carb fiber sources. Some foods have so much natural fiber in them that they have very few, to virtually zero, net carbs. Celery, for example, has often been called a “negative” food because it’s been said that it takes more calories to eat it and burn it than the entire food contains. It also has 1.2 grams of carbs per serving with half of that (0.6 grams) coming from fiber. So, you can see, you can eat a lot of celery due to the high fiber content before you’ll even be close to reaching your carb goals for the day. Do net carbs “erase” the carbs you’re eating? Well, it’s not quite that easy. The fiber will not magically make the carbs you eat disappear; especially if they are not naturally occurring in the food you’re eating. Not to mention, it would take a great deal of fiber to “negate” all the carbohydrates in a pizza, for example. And, with that much fiber, you just might not feel so well once it expands in your stomach, and we won’t even think of the effects too much fiber might have on your system the next day. Essentially, it’s best not to try and concoct a work-around by using fiber as an excuse to overindulge in carbohydrates. Sugar alcohols are carbohydrates, with a molecular structure similar to sugar, and also similar to alcohol. Alcohol and sugar have some interesting similarities and both can affect the body negatively. You, personally, may also not react well to sugar alcohols. This is, in part, due to the fact that while the sugars do not dissolve in your mouth (avoiding cavities), they do break down in your bowel where they are fermented; causing discomfort for many. Often, people report undesirable side effects from the consumption of foods containing sugar alcohols. Some negative occurrences include diarrhea, gas and bloating. Sugar alcohols do typically also contain calories, so “sugar-free” does not mean “calorie free” or sugar alcohol free. And, more bad news for sugar alcohols, some of them can still cause your blood sugar to spike because they’re high on the glycemic index. One additional tidbit to keep in mind is sugar alcohols can (and often do) awaken cravings and the need for additional sweets for some people. This is a slippery slope and one you may not be ready to traverse, so be wary when considering sugar alcohols. Certain sweeteners, like Xylitol and Sorbitol are still quite high on the Glycemic Index with levels of 13 and 9, respectively. One to really avoid is Maltitol, which boasts a sky-high GI value of 36. As always, it’s a prudent move to read labels carefully and note all the ingredients. Certain products may contain a “majority” of the sweetener you think you’re getting, but you’d be surprised to learn there are additional fillers that may contain many more carbs and sugars than you were prepared for. When in doubt, don’t eat it. Keto diet experts also say that if you’re having any type of gastric distress, or you are plateauing and just can’t seem to get past it, getting the sugar alcohols out of your diet could be a big help, and assist you in breaking through to the next level of progress. Just in case you had the thought “what about carb blockers” on the tip of your tongue, you should forget about them. They are not proven, and they can also have some very unwanted side effects like extreme gas, bloating and diarrhea. And don’t forget, they block things … that means, they not only cause carbohydrates to pass through your system un-utilized (maybe), but they also don’t allow you to absorb other things you are trying to assimilate like vitamins, for example. It can be a dangerous game, and isn’t worth the few extra carbs you might be able to eat. For more bad news about carb blockers, you can take a look at what the Livestrong website has to say about them in their article, Side Effects of Carb Blockers.